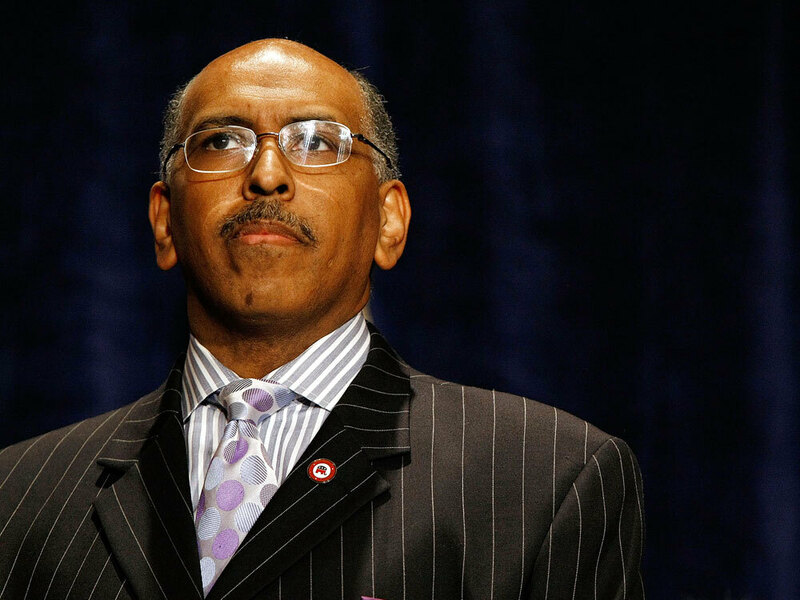 Steele: Don't Raid Medicare To Fund Health Changes Republican Party Chairman Michael Steele opposes a government-run health care system, as do most members of his party. While most health care overhaul proposals assume big savings by reworking Medicare, Steele says Medicare needs to be protected and not cut in the name of health insurance reform. But he also says he favors some cuts to maximize the program's efficiencies. Republican Party Chairman Michael Steele opposes a government-run health care system, as do most members of his party. While most health care overhaul proposals assume big savings by reworking Medicare, Steele tells NPR's Steve Inskeep that Medicare needs to be protected and not cut in the name of health insurance reform. Republican Party Chairman Michael Steele is making proposals on health care. He wrote in the Washington Post that he opposes a government-run health care system. His party has attacked government involvement in health care all summer. That rhetoric is complicated by something else Steele wants to do. As part of what he calls a Bill of Rights for Seniors, Chairman Steele writes, quote, "We need to protect Medicare and not cut it in the name of health insurance reform." Democratic health care plans assume big savings by reworking the government's Medicare program for seniors. When we sat down with Steele early this week, we asked what he wants to do with Medicare. Mr. MICHAEL STEELE (Republican Party Chairman): What makes it a valuable program is that it is the last line of opportunity to receive health care for a lot of our seniors, and it has been now for - since the 1960s. The problem is, as we all note, that the system has been raided over the years, from time to time. It's become bloated, and in some cases efficiencies have not been maxed out. Therefore, it's running into problems where, you know, every few years we're having stories about Medicare falling apart and, you know, we've already projected it's going to be out of money in a few years. INSKEEP: It's going to run out of money. INSKEEP: But you're coming here against reducing the spending on Medicare, restraining Medicare. Mr. STEELE: No, no, no, no, no, no. That's not coming out against reducing the spending. That is not - I mean, that's a wonderful interpretation by the left, but what I was saying was don't go raiding the program without some sense of what we're taking from the program, the impact it's going to have on the senior citizens out there. You know, raiding a program that's already bankrupt to pay for another program that we can't afford is not good public policy. INSKEEP: So you would be in favor of certain Medicare cuts? Mr. STEELE: Absolutely. You want to maximize the efficiencies of the program. I mean, anyone who's in the program would want you to do that, and certainly those who manage it want you to that. INSKEEP: Here's another thing that I'm trying to figure out: Within a couple of paragraphs of writing we need to protect Medicare, you write that you oppose President Obama's, quote, plan for a government-run health care system. INSKEEP: Now you're a veteran public policy official. You're aware that Medicare is a government-run health care program. Mr. STEELE: Yeah, look how it's run. And that's my point. Take Medicare and make it writ large across the country, because here we're now - how many times have we been to the precipice of bankruptcy for a government-run health care program? INSKEEP: ...but you write in this op-ed that you want to protect Medicare because it's politically popular. People like Medicare. INSKEEP: That's why you're writing to protect Medicare. Mr. STEELE: Well, people may like Medicare, and liking a program and having it run efficiently is sometimes two different things. And the reality of it is simply this: I'm not saying I like or dislike Medicare. It is what it is. It is a program that has been around for over 40 years, and in those 40 years, it has not been run efficiently and well enough to sustain itself. You have Medicare. You have Amtrak. You have the Post Office - all these government-run agencies that try to inject themselves into private markets typically don't do too well. My only point is that, okay, Medicare is what it is. It's not going anywhere. So let's focus on fixing it so that we don't every three, five, 10 years have discussions about bankruptcy and running out of money. Mr. STEELE: Let's get it to run right. INSKEEP: ...and yet you are opposing, quote, government-run health care. Mr. STEELE: Exactly. Well, wait a minute. Just because, you know, I want to protect something that's already in place and make it run better and run efficiently for the senior citizens that are in that system does not mean that I want to automatically support, you know, nationalizing or creating a similar system for everybody else in the country who currently isn't on Medicare. INSKEEP: Let me ask another question here, because you warn that some of the health care proposals out there would, quote, create government boards that would decide what treatments would or would not be funded. And you want that decision to be between the doctor and the patient. When a private insurance company pays now, what is your impression of who decides what that private insurance company is going to cover? Is that purely between the doctor and the patient now? Mr. STEELE: Sometimes it is, and sometimes it isn't. It depends on the type of treatment and the medicines that are at stake. And I've had this same experience my own self where I - you know, I've needed a certain type of, you know, medication and it, you know - the insurance company is like, well, you can have it, but we'll only pay for this amount or this portion. I don't like that any more than I like the government doing it. INSKEEP: Wait a minute, wait, wait. You would trust the government to look into that? INSKEEP: You said that's something that should be looked into. Who is it that should look into that? Mr. STEELE: I'm talking about those who - well, who regulates the insurance markets? Mr. STEELE: Well, and so it - wait a minute, hold up. You know, you're doing a wonderful little dance here and you're trying to be cute, but the reality of this is very simple. I'm not saying the government doesn't have a role to play. I've never said that. The government does have a role to play. The government has a very limited role to play. INSKEEP: Mr. Chairman, I respect that you feel that I'm doing a dance here. I just want you to know that as a citizen, I'm a little confused by the positions you take because you're giving me a very nice nuanced position here. Mr. STEELE: It's not nice and nuanced. I'm being very clear. Mr. STEELE: What's nuanced? What don't you understand? INSKEEP: Come to the actual rhetoric, it seems more along the lines of absolutes. It's between the patient and the doctor. INSKEEP: I'm not saying nuanced is a bad thing, sir. Mr. STEELE: I'm being very clear. I want to have an open debate. I want to put ideas out there. I want the people to understand what this is going to look like when it's all said and done. And I'm not - you know, seriously, I'm not trying to be nuanced. I'm not trying to be cute. I'm trying to be very clear. I'm not saying the government doesn't have a role to play here. It does. It's managing a Medicare program, so it has a role to play. INSKEEP: Maybe we're getting hung up on the word nuance. Maybe I should say complicated. Do you find it challenging to get into this complicated debate and explain things to people in a way that it's honest to the facts and still very clear and doesn't just kind of scare people with soundbites? Mr. STEELE: That's a good point, then. Well no. Look, no one's trying to scare people with soundbites. I mean, you know, I've not done that, and I don't know any of the leaders in the House and Senate that have done that. And so, yeah, it's complicated, and you want to break it down. Mr. STEELE: Regulation D was the prescription drug program that was put into place under the Bush administration. Mr. STEELE: And the reality of it was it was complicated and it was confusing. We try to make it as straight-forward as we can without getting into a lot of the, you know, the nitty-gritty stuff that - you know, the minutia, if you will. But you've got to do it. You've got to deal with both ends of that spectrum, and we try to do that every day and I think through the senior health care bill of rights, this is one way for us to try and do that. INSKEEP: Mr. Chairman, enjoyed the time. Thanks very much. Mr. STEELE: All right. Thank you. INSKEEP: Michael Steele is the National Republican Party chairman.